You've seen the windswept, streamline figures riding on the radiator caps of luxurious 1920's/30's cars and limousines. The Modernists embraced “speed,” a new reality in auto, air and rail travel. Speed designs appeared in a wide range of objects and decorative details. 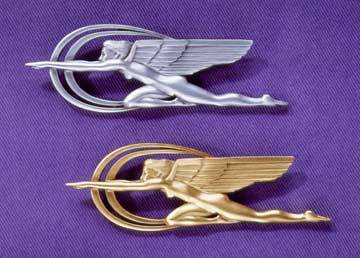 We had our Zephyr pin reproduced from the one that Bob has worn and cherished for years, originally part of a radiator cap. It measures 3" wide and comes in your choice of matte silver or antiqued gold finish. Suitable for any outfit. Why not get one of each.